My hair, skin and nails were a mess due to medication I was taking. 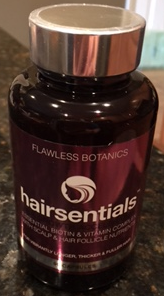 I had the opportunity to try out Hairsentials by Flawless Botanics. This product contains Biotin and 22 other ingredients to help with hair growth. My hair was lifeless, falling out and so thin. Since taking this product my hair is shiny and healthier. I absolutely love this product and would recommend it anyone who needs help with hair growth. *I received this product for free in exchange for an honest review. The opinions expressed here are 100% my own.